According to the Centers for Disease Control and Prevention, 30 percent of adolescents and close to 27 percent of low-income preschool children in South Carolina are already overweight or obese. Public health sciences faculty member Sarah Griffin is looking to be part of the solution. Recently named a Greenville Health System (GHS) Faculty Fellow, she will help lead GHS-Clemson research in childhood obesity and pediatric population health management. Griffin will work with the GHS Children’s Hospital Department of Pediatrics to examine the effectiveness and costs of obesity prevention efforts associated with three GHS initiatives: the Greenville Memorial Childcare Center; the New Impact childhood obesity treatment program; and GHS health clinics at Berea, Lakeview and Tanglewood middle schools in Greenville. Griffin is the third Clemson faculty member to be named a GHS Faculty Fellow. Each fellow is strategically embedded in a GHS department, shifting their focus from their regular teaching duties to developing a comprehensive research agenda with their GHS department. June J. Pilcher, Alumni Distinguished Professor of Psychology, has been named the 2015 recipient of the 1939 Award for Excellence. The award, endowed by the Class of 1939, is presented annually to one distinguished member of the faculty “whose outstanding contributions for a five-year period have been judged by her/his peers to represent the highest achievement of service to the student body, University and community, state or nation.” With this award, Pilcher also becomes an honorary member of the class and is provided with a monetary award equal to the value of $5,000 in 1989 dollars. Pilcher is passionately dedicated to teaching, which is also evidenced in her research with numerous graduate and undergraduate student collaborators. Pilcher has earned an international reputation for her research on the effects of sleep deprivation in humans and has recently added studying the effects of sedentary behavior on stress, health and well-being. She was selected as a Fellow by the Association for Psychological Science (the primary national association for research psychologists) and was the Fulbright-Freud Visiting Scholar 2011-2012 at the University of Vienna and the Sigmund Freud Museum in Vienna, Austria. She is currently a candidate on the Fulbright Specialist Roster for Public/Global Health. EVERY YEAR THE ALUMNI ASSOCIATION accepts nominations for the Distinguished Service Award, the highest honor bestowed upon a former student. This year’s honorees are, as the name of the award says, a distinguished lot. They have been recognized by their peers professionally for impressive achievements. They have contributed to their communities both publicly and privately, serving on boards and volunteering without expectation of reward or recognition. They have stayed connected with Clemson, giving back in time and talent and resources to benefit current and future students. At their core, more than anything else, these folks reflect those characteristics that define Clemson University. They are visionary, bold, competitive, determined and proud. They value family, tradition and loyalty. And they love orange. They are Tigers, through and through. The pages of this magazine don’t contain enough space to list their many accomplishments and achievements or the numerous ways they have found to make their communities better places to live and Clemson a better place to learn. We’d have to double the pages to enumerate their activities as students and their involvement as alumni. Here they are, this year’s Distinguished Service Award honorees, with just a sampling of what makes them stand out. Bryant Barnes is the fourth generation of his family to lead Comporium, a Rock Hill-based telecommunications company, and his leadership has resulted in a dynamic, streamlined and progressive company. Under his leadership, Comporium partnered with the city of Rock Hill to transform an eyesore of an empty parking lot into Fountain Park and is now working to transform a vacant textile mill into a bustling mixed-use development. Barnes has been deeply involved with area charitable organizations in support of children, health care and education. Under his leadership, Comporium also contributed $1 million in 2009 to the Optoelectronics Research Center of Economic Excellence in the Holcombe Department of Electrical and Computer Engineering. Barnes was one of the founding partners of the Barker Scholars Endowment, and the Barnes family contributed $1 million to repurpose the Sheep Barn at Clemson to be “The Barnes Center,” in honor of his father. Comporium is the latest Founding Innovation Partner of the University’s Watt Family Innovation Center, to which they have pledged $3 million in financial support and in-kind products and services. With a master’s in industrial engineering and experience working with Andersen Consulting and IBM, Janine Bowen went on to earn a law degree. She rose to partner at McKenna, Long & Aldridge, then founded JACK Attorneys and Advisors, a technology and intellectual property firm. The list of organizations she serves makes it clear that she has a strong commitment to the poor and homeless in her community. In her Clemson involvement, Bowen exhibits what one colleague called “a remarkable and rare collaborative dynamic,” displaying an analytical approach that would allow her to identify potential problems and recommend solutions. She has been the face of the Clemson family to many students in industrial engineering, providing support financially and through volunteerism. She established an endowment for the department in 2009, and an endowment supporting the PEER (Programs for Educational Enrichment and Retention) in 2011 in honor of her mother. As an attorney with two prominent firms in Greenville, Grant Burns represented clients in trials and arbitrations in 20 states. He moved on to corporate practice with AFL, a telecommunications firm, along the way being named one of Greenville’s “Best and Brightest, 35 and Under.” He has broad community involvement, with membership on boards of organizations that provide housing, shelter and economic development. He served as president of the Clemson Alumni Association during the transition that changed the group into a smaller Alumni Board and larger Alumni Council, leading that process with courage and foresight. 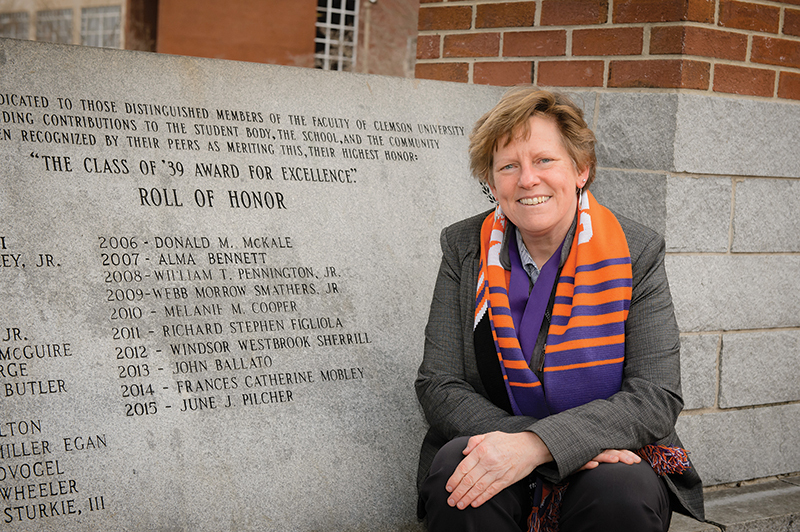 One colleague commented that she did “not recall having seen someone who has had an impact [on Clemson] in such varied ways, prior to turning 50.” He has demonstrated his love for Clemson through the use of his time, the sharing of his talents and the gift of his resources. 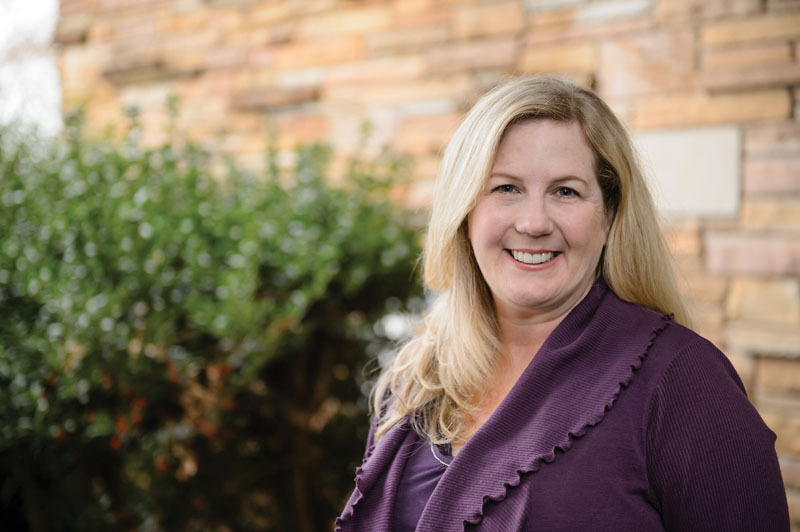 Leslie Callison has had a lasting impact on the future economic development and educational success of many counties in South Carolina through her collaborative approach to assisting them in achieving technology certification. Committed to her local community as well, she was a founding director of Columbia’s EdVenture Children’s Museum and extensively involved in supporting her children’s schools. Doug Richardson brought what he had learned during his distinguished career in banking and consulting to a position at Clemson, leading the Clemson University Foundation to great achievement, establishing structures, formalizing procedures and methodologies, and stewarding significant growth of endowments. He helped lead the real estate acquisition, financing and development of CU-ICAR. He is a veteran, with tours of duty at the Quartermaster Depot in Philadelphia and in Vietnam. In his church, he has served as a leader, peacemaker, mentor for youth and bridge builder between persons of different backgrounds and perspectives. Active on the Class of ‘64 reunion committee, Richardson, along with his wife Wilmer, has supported current and future students through a legacy gift for the class endowment, which supports the Academic Success Center and a scholarship endowment, and the Kappa Delta Chi Brotherhood Scholarship Endowment for students with financial needs. Clemson is one of the featured participants in Google’s Expeditions Pioneer Program, a virtual reality project that will enable children in schools across the world to visit colleges and universities without ever stepping foot on the campuses. One of the locations the Google virtual campus tour will take students is Clemson’s historic Bowman Field. Clemson is the first university in South Carolina invited to participate. Schools in the program represent a wide variety of institutions, from community colleges to internationally recognizable universities. The virtual reality experience can be accessed with a smartphone and Google Cardboard — a simple cardboard viewer that can be ordered or built with downloadable plans through the Google Cardboard website: https://www.google.com/get/cardboard. Clemson’s Creative Services and Digital Marketing teams worked together to create text and imagery to feature in the virtual tour experience. Viewers of Clemson content in the program will be able to experience more than 30 points of interest on campus via panoramic photography, including the Watt Family Innovation Center, R.M. Cooper Library, the Outdoor Amphitheater, Bowman Field, Howard’s Rock and many others. Google hopes to release the app to the public by the end of the 2015-2016 school year. Until then anyone can request access by going to https://goo.gl/fuQb6c. and IPTAY, including $19.5 million of athletic revenue bonds, along with private support. Coach Swinney describes the new complex as the “epitome of Clemson: fun, special and the best in the country.” To that end, one of the goals of the facility is to provide members of the football program and visitors with a unique Clemson experience. 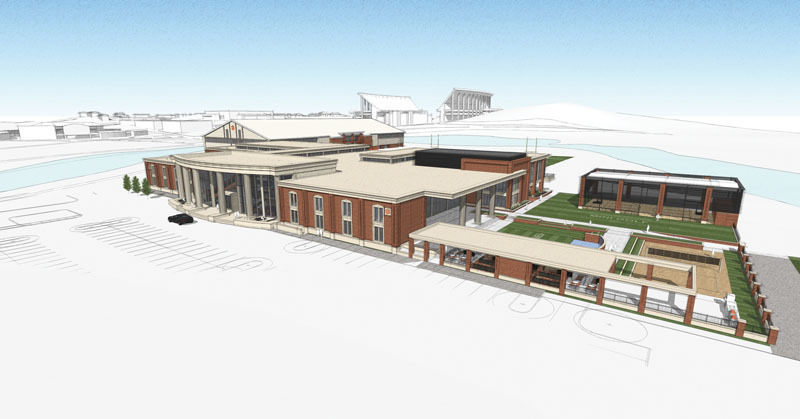 In addition to an indoor replica of the Hill and Howard’s Rock, the facility will include a career development and leadership center, a players’ lounge, locker rooms, training/rehab facility, weight room, nutrition center and dining facility, meeting rooms, coaches’ offices and a first-of-its-kind recruiting war room. In Death Valley, a knitted tiger hat crowns one fan’s head. The student has painted a giant Tiger paw on her face, the only interruption on it being her giant smile. A camera click later, she will be a face of Clemson as part of an admissions brochure. She will show her Clemson spirit to thousands of prospective Tigers. ‘I want to be her, and I want to be there, at Clemson,’” Robertson said. Four years later, Robertson has, in a way, become the girl in the Tiger hat: She is a voice of Clemson to future students. Not only has she been a front row fan at football games with her own face painted like a Tiger, she has spent her college career telling the Clemson story. 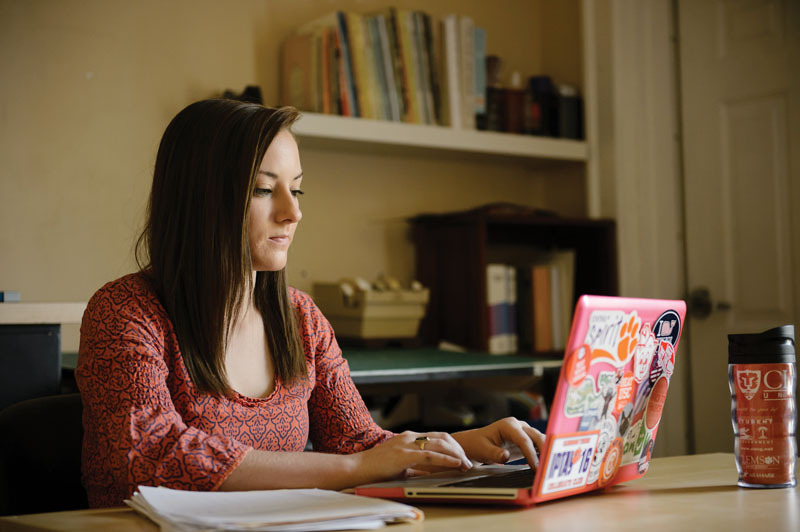 Since her second semester, Robertson has worked as a writer for Creative Services, which creates and manages much of Clemson’s marketing and branding materials. Intimidated when she first heard about it, she almost didn’t apply, but a deeper connection with the position changed her mind. “I found out that the office also manages the admissions material. I told myself, ‘All right, you’re doing Creative Services,’” Robertson said. Eventually, her writing position became part of Clemson’s UPIC on-campus internship program. While her responsibilities occasionally include writing copy for brochures like the one she received, she mainly writes stories for the University’s website. She has also written for this magazine. Her mentor throughout the internship has been Crystal Bennett, the University’s Web content developer. Bennett works with Robertson and other interns on developing their writing by encouraging creative critical thinking. Based on her experiences with Creative Services — and especially because of how much she has valued Bennett’s mentorship — Robertson thinks every student should have an opportunity at an on-campus internship. But it’s Robertson’s uniquely Clemson persona that makes her such a good voice for Clemson. Like any good fan, Robertson is “All In” for her team. She carries an orange backpack and has a closet full of orange shirts. She’s never missed a home football game, and when students camped out for tickets, she was always out there with a tent. Her passion isn’t limited to the field; she also goes all out for basketball games and other sporting events. She does more than cheer for her Tigers, though: She learns about real ones too. A former member of the Tigers for Tigers (T4T) organization, which seeks to protect and care for tigers in the wild, she went to India over spring break with a biodiversity class led by the faculty organizer of T4T. She will be graduating in May with a double major in communication studies and English, then headed off to a job as a Web copywriter and website designer at an agency in Charlotte, N.C., where she’ll be working with telecom companies on digital marketing campaigns. But for all of her accomplishments outside of her job and her future in bigger markets, Robertson is extremely proud of her work as an undergrad. Note: This story was written by Leah VanSyckel, another member of the Class of 2016. Clemson University’s Reserve Officers’ Training Corps celebrated the ROTC’s 100th anniversary on Bowman Field. The ceremony named two outstanding former Army cadets – retired Lt. Gen. Gene Blackwell and retired Col. Ben Skardon – to the Clemson ROTC Hall of Fame. Former outstanding cadets were also named patrons to each training unit. Each patron’s story was read, and there was be a mini “museum” of artifacts from the university’s Special Collections on display. The ceremony was streamed live online on ClemsonTV. Clemson has a much longer military heritage since its inception in 1889,” said Lt. Col. James Mullinax, a professor of military leadership and commander of its ROTC program. “Being a former military school, Clemson has embraced ROTC fully since we went to an all-volunteer force. The support Clemson provides cadets is unmatched across the nation,” he said. “Clemson not only provides scholarships, but also provides great visual reminders all over campus of the sacrifices our service members have made in defense of our nation. This support to the ROTC programs has made them stronger today than at any point in time and this shows in the quality of lieutenants Clemson is producing every year. Cadets are carrying on a great military tradition that Clemson was founded on.” Col. Christopher Mann, commander of Clemson’s Air Force ROTC detachment – the Flyin’ Tigers – said it has been part of Clemson since 1947, the year the U.S. Air Force became a separate and independent service. “Since that time, Clemson graduates have served their nation honorably and with total commitment to the Air Force core values of ‘Integrity First, Service Before Self, and Excellence in All We Do.’” Clemson’s Air Force ROTC has had 22 general officers produced from its ranks over the past 68 years. 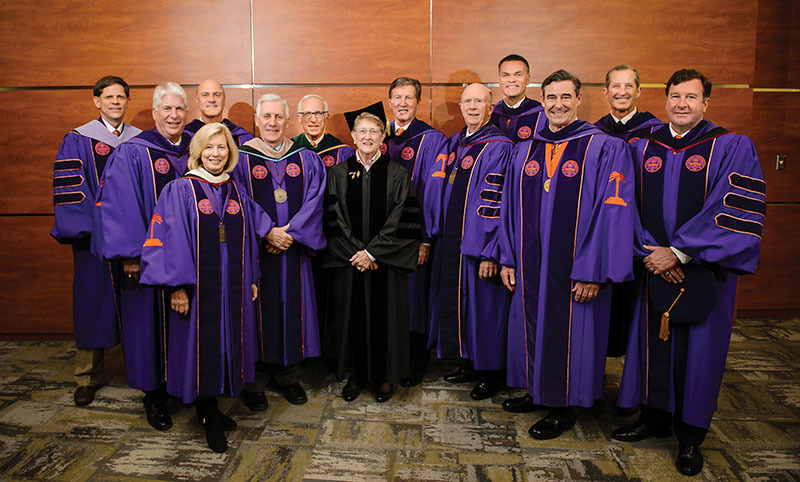 Jean Toal (center) with the Clemson University trustees. South Carolina Supreme Court Chief Justice Jean Hoefer Toal is the latest recipient of an honorary Doctorate of Humanities from Clemson. The degree was bestowed on her at the December 2015 graduation ceremony in Greenville for her devotion to law, public service and the people of South Carolina. In 1988, Toal became the first woman to serve as a justice of the South Carolina Supreme Court. She retired as chief justice on December 21, making her the longest-serving member of the court. When she was admitted to the South Carolina Bar in 1968, women comprised less than one percent of the licensed lawyers in South Carolina. for 20 years prior to her election to the South Carolina Supreme Court. She served in the South Carolina House of Representatives, representing Richland County, for 13 years. She was the first woman in South Carolina to chair a standing committee of the House of Representatives and served as chair of the House Rules Committee and chair of the Constitutional Laws Subcommittee of the House Judiciary Committee. Since 1970, the Carnegie Commission on Higher Education has been providing a framework to describe and recognize different types of educational institutions in the United States. The rankings are determined by a number of statistical measures including research and development expenditures, research staff including postdoctoral appointees, and doctoral conferrals. Paul Mardikian, senior conservator at the Warren Lasch Conservation Center, chisels away deposits on the Hunley’s propellor.